JCDecaux UK, the UK’s no.1 Out-of-Home (OOH) media company announced the launch of its newest digital network of screens outside Waitrose & Partners’ stores across the UK which went live on Monday April 2019. The network follows the award of a new long term Waitrose & Partners’ advertising contract, awarded to JCDecaux UK in January 2018, after a competitive tender process. 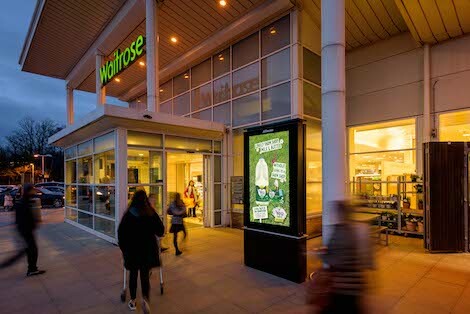 the network comprises 100 screens across stores UK wide, delivering a premium communications channel for brands and will feature a mixture of Waitrose & Partners content and external advertising placed by JCDecaux. The new digital screens will reach audiences across 100 high footfall stores and are located in proximity to store entrances – the 75′ high-definition, digital 6-sheet screens provide maximum visibility and flexibility for brands and engaging, up-to-the-minute content for shoppers. This entry was posted on Monday, April 8th, 2019 at 16:03 @711 and is filed under DailyDOOH Update. You can follow any responses to this entry through the RSS 2.0 feed. You can leave a response, or trackback from your own site.